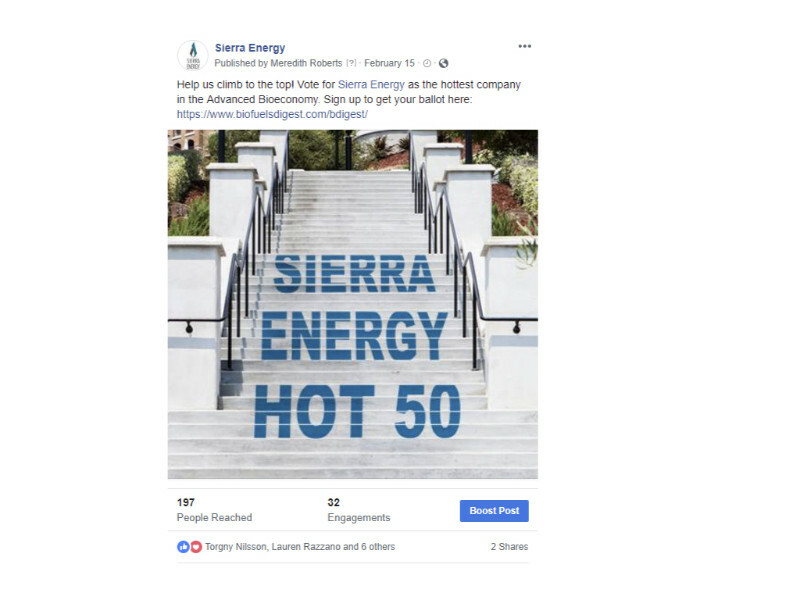 This is an official photo vote submitted for the 2019 Hot 50 by Sierra Energy. Photo Votes are distributed via the Digest, Twitter and LinkedIn (subject to review for taste and originality) and each Like for each photo vote counts for 1 additional vote in the Hot 50. Notes on PhotoVotes. This year, you may submit Photo votes in support of your candidate company. Each Photo Vote will count as five votes, and should be submitted between between February 11, 2019 through March 15, 2019 to [email protected] The photo must be an original creative work — substantially created for the competition — and must contain the name of the company you are voting for and the words “Hot 50”. Repetitive photos (e.g. a photo of every employee in the company, holding a “Hot 50” sign), will not be counted. The Digest retains the right to reject any photo on the grounds of lack of originality — e.g. repetitive photos for the same company, images that are from the public domain simply with a “Hot 50” inserted. Images from the public domain can be used if they are used as a springboard for an original creative effort representing an original idea.